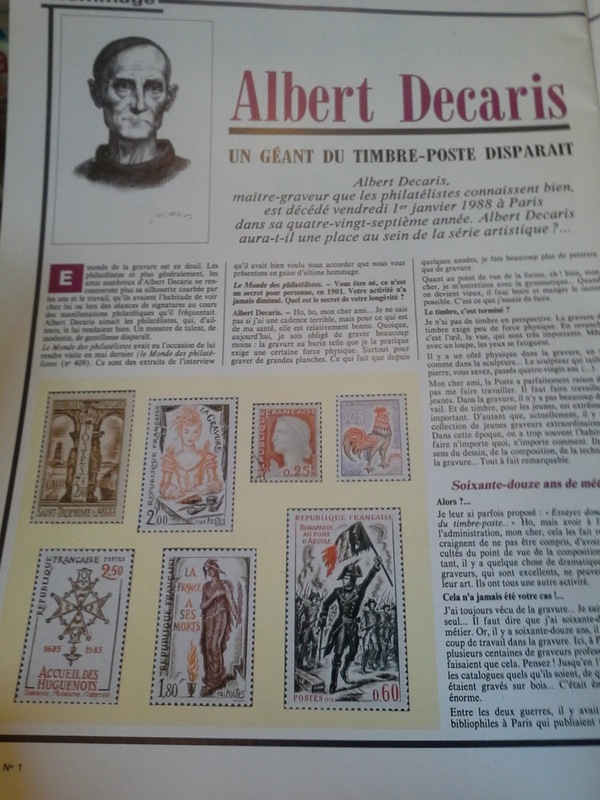 Not long after I started collecting the philatelic work of Albert Decaris about two and a half years ago, I came across a collected catalogue of his work in book form. 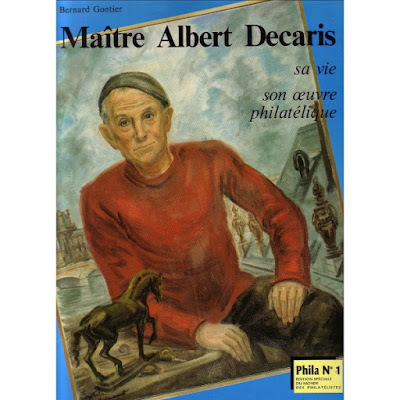 The book is by Bernard Gontier and it is called Maitre Albert Decaris, sa vie son oeuvre philatelique. I thought to myself, "great, this is exactly what I need!" As it turns out - like with most things that would be handy to have - it was nigh on impossible to track down. And the one copy that I did happen to find on Delcampe had a ludicrous price + postage cost attached to it. Every other option I looked into, the book was simply not in stock. I filled out the requisite details on heaps of sites that would inform me of one being in stock. I could hope, right? Sadly, not in this case. As of this moment, I've heard back from exactly none of those sites. But then about a month ago whilst I was doing an image search related to a blog post, I came across an image of the cover of the book that I hadn't seen before. Just like the actual book, images of it are fairly scarce. Out of curiosity, I clicked on the image and it took me to a French philatelic shop that had a whole range of products available. But what interested me was that they had the Gontier book on their order list. I clicked on that, expecting to see the same old story. Sorry, not currently in stock. But no! Miracle of miracles, they had one copy in stock! And the price on it was excellent. I couldn't bring myself to believe it at first. Surely it was a mistake. Or just a printed image of the cover for sale. Or maybe the postage on that site was ridiculous. First I checked out the postage - reasonable. Then I had a hard look at everything about the book. Seemed fine. Now growing somewhat excited I looked around the site a bit to see how valid it was. It seemed legit. With trembling fingers (not much hyperbole here! ), I returned to the item page. And I clicked "Purchase". For a few days afterwards I could still hardly believe my luck! Then skip forward a few weeks, and what was in the mail? The Decaris catalogue! And it is everything I'd hoped it to be. On my Slania Crazy! blog I did a review on the catalogue of Slania's works, so I thought I'd do the same here. First of all I really need to stress that the thoughts expressed in this review are solely my own, and I'm sure there are those out there who have different opinions. If you feel differently to what I think please add your thoughts to the comments. I love hearing from fellow collectors! With that said, let's get into it. Maître Albert Decaris, sa vie son travail philatélique, by Bernard Gontier. Published by Monde des philatélistes. Printing date unknown. The first step would be to take a look at the overall presentation of the book. I was really surprised at the dimensions of the book. It measures a whopping 32cm x 24cm. It has 40 pages and it is bound in a soft cover. The fact that it is so large with only a soft cover is really my only criticism. This makes it a little difficult to consult time and again without any fear of damage. Its unusual height also makes it difficult to store on my shelf. Not surprisingly, the book is written entirely in French, which doesn't bother me, but some may find information extraction a little more difficult. The book is printed mostly in black & white, including the stamp images. But there are several lovely full page colour phtotos included. The contents of the book include: a catalogue of all Decaris' stamps; a few full page colour images of a selection of unadopted designs; and a group of three interesting articles in the back including an interview with Decaris. The catalogue portion of the book is brilliant. 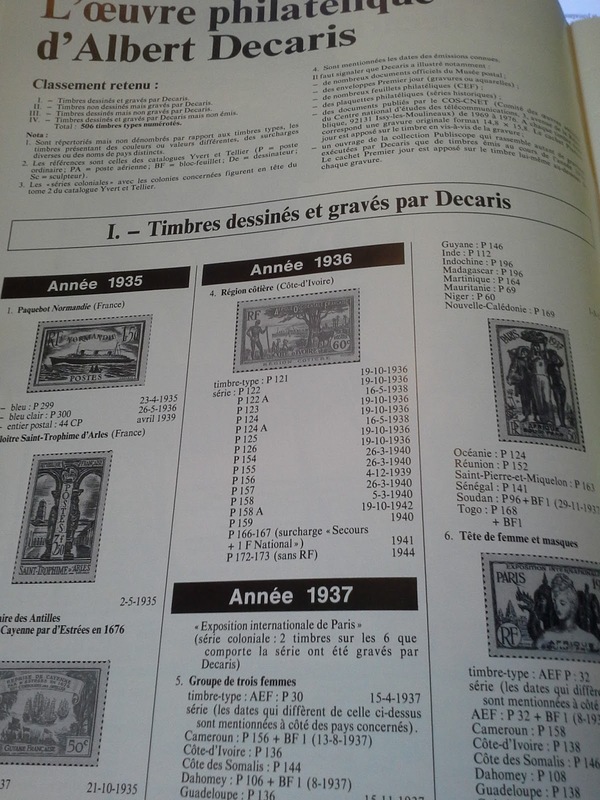 The stamps are arranged by year with the actual date of issue and Y&T catalogue numbers included. It is divided into three sections. 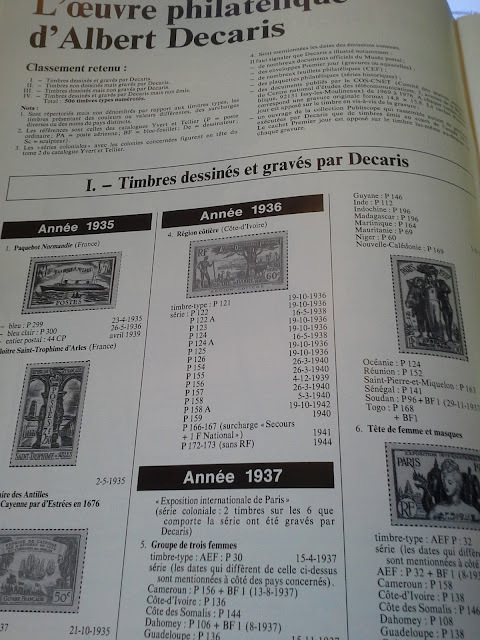 The first section lists all the stamps Decaris designed and engraved. The second section deals with the stamps he only engraved. 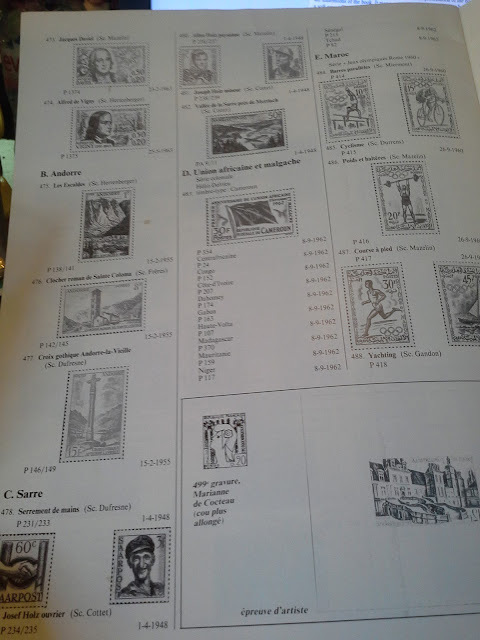 And the last section lists the stamps he only designed. Below is a small selection of images from within the book. Unfortunately due to the size of the book, it wont fit in my scanner, so I have to include photos instead of scans. But the images are just to give you an idea of the content. In all I love this catalogue, and honestly I find it a lot more useful than my Slania catalogue, but that's just my humble opinion. If you have any comments or questions, comment below. I'd love to hear your thoughts. Congratulations! I remember having examined it in the reading room of the Musée de La Poste back in 2005 and am happy to have been able to signal its existence.